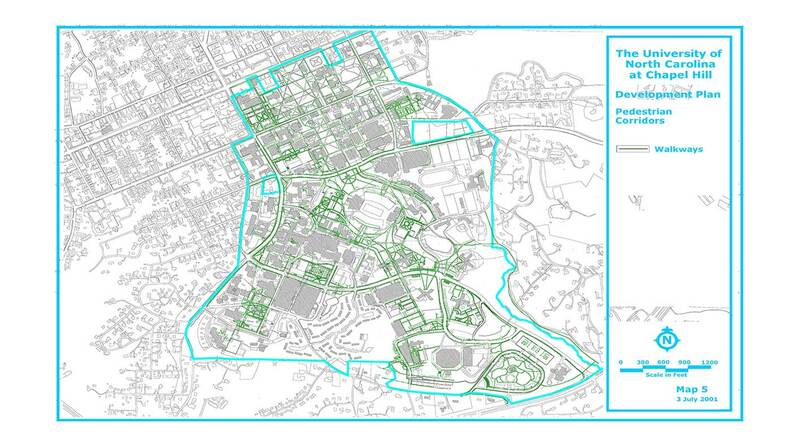 The Campus Master Plan, approved by the Board of Trustees in March 2001, was developed with the goal of improving pedestrian access, specifically to increase the network of pedestrian paths on South Campus to emulate that of North Campus. New north-south links are created in valley areas that currently contain large surface parking lots. New parking decks with grass roofs will be built in their place enabling pedestrians to cross from one side to the other on a level surface. In other areas pedestrian bridges will span heavily traveled roads. Map 5 illustrates the improved pedestrian network planned for the proposed Development Plan. Site Development Plans for buildings in the approved Development Plan will be prepared in accordance with the UNC-Chapel Hill Construction Guidelines. All designers on the University campus are required to use this document in project development. The new UNC-Chapel Hill Construction Guidelines will include the following language regarding pedestrian circulation.